Last summer, I started riding my bike for the first time in over 15 years. I really enjoyed it as I commuted to work. As the weather got colder, so did my face! I am not even a fast cyclist and quite slow really. I still need something to protect my face on early morning bike rides. I also thought it would could double as a running balaclava. 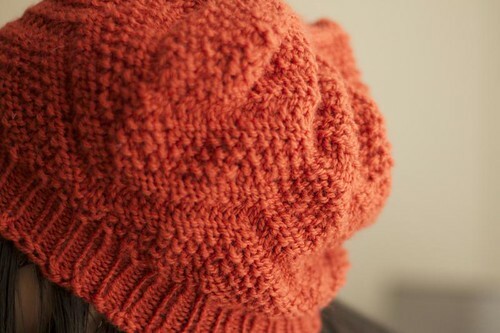 As with others on Ravelry, I was not that satisfied with the face opening or shaping. I tried to modify it, but it was still too big. I would have tried to make the face hole even smaller except I was running out of yarn. I quickly did a round of single rib to finish it off. I did like the addition of the strap holes and instead of two pigtail holes, I put one ponytail in the back. When I saw this in the magazine, I thought it would be really suitable for my friend G who had requested a hat for her belated birthday gift. She really liked it and even has a wool scarf of the same colour. This hat took one lazy Good Friday to make as I watched several shows. This was a true stashbuster as I used Patons Classic Wool leftovers from some legwarmers I made for another friend. I don’t look very good in orange so if G hadn’t like this hat, I’m giving it away to someone else. Amstel Hat, started March 29th 2013 AM, finished March 29th 2013 PM. 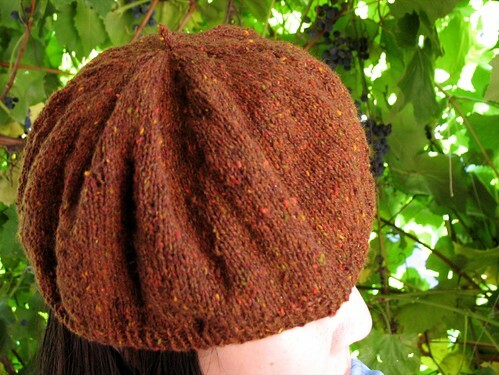 Pattern: Amstel Hat by Courtney Kelley from Interweave Knits, Fall 2012. Yarn: Patons Classic Wool – old yardage: 223yds/100g – Paprika – had 56g (124yds) and used all but 2g. No other mods, but my gauge was tighter, probably 18 sts = 4”/10cm so it is a small beret. Cost of Project: None as the yarn itself was a gift. Would I knit it again? Sure, but it would need to be bigger for my own head and hair. Not really my style either, but quick and easy pattern. 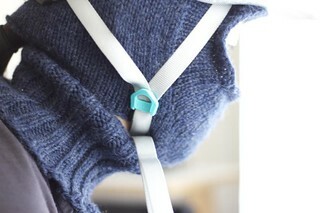 Helpful Links: Techknitter’s Disappearing Loop Cast On and Jeny’s Suprisingly Stretchy BO. Have a good weekend! For more FOs, go to Tami’s Amis. This is my second Shedir. My first Shedir was made over five years ago. 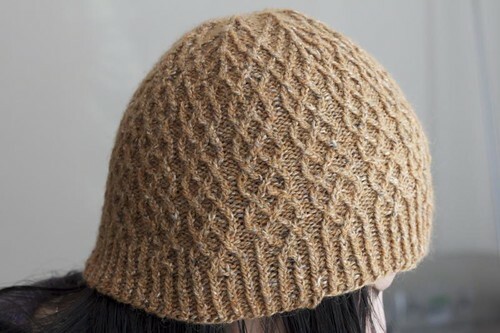 I really liked this pattern the first time, and it is one of the items that many knitters and non-knitters alike remark on. I only did the main cable repeat 4 times because a lot of people said the hat was too long. It was a tad too short as it barely touched my ears. It was a beanie and I needed more of a toque. It is warm and light though. Secondly, since this has been my favourite winter hat, I’ve gotten a lot of use out of it so it has felted over time. When I bought this oddball of Felted Tweed probably in 2008, I had a feeling that I would knit this pattern again. The universe may be sending me a message that I should not wear red knit hats because every time I make one, they end up too big or too small. This one ended up being way too big, and I am someone with an above average head size. I like the fact the pattern is top-down, but I really was not in the mood to make this hat and made several mistakes while doing the lace. I probably will never wear this hat. This red Cascade 220 is the one I ripped from Koolhaas (and from leftovers of Gretel) and that for some reason, I keep having bad luck with it though it’s a lovely colour and yarn. I still have one skein of it which will go into storage for who knows how long because of my upcoming move. Yarn: Cascade 220 (220 yards/100g) in #800 Cranberry – I had exactly 58g left (weighed at my LYS) of this. Modifications: Emily Ocker CO and I only knit 5 rows of 1×1 rib because I was running out of yarn. Would I knit it again? Doubtful. If I do, I’ll use lifelines or make the chunky version or the beret mod. 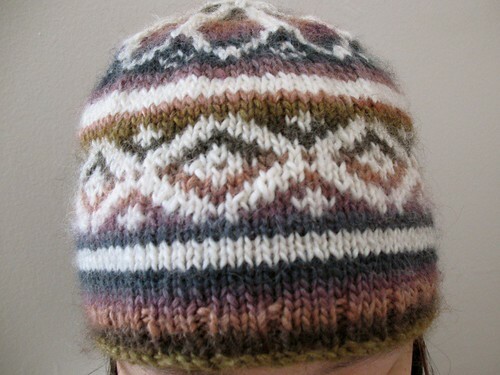 What a lovely hat pattern. I tried to find some beads for this more than once, but I did not have much luck so I just decided to do it beadless and took a tip from another knit blogger by purling where the beads are suppose to be. It was a super quick knit which yields lovely results. I love the yarn; it is yet another oddball that I bought. 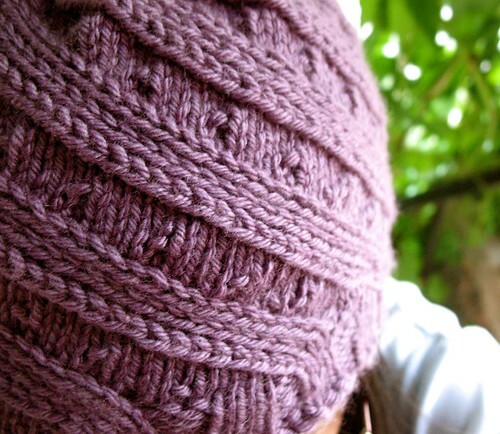 The colour is great, but the yarn is wonderfully soft to knit with. 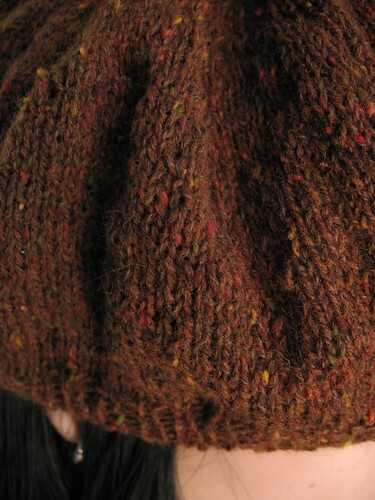 I suspect it will pill quite easily over time, but that just makes me want to buy this yarn again and make another hat. Would I knit it again? Yes! 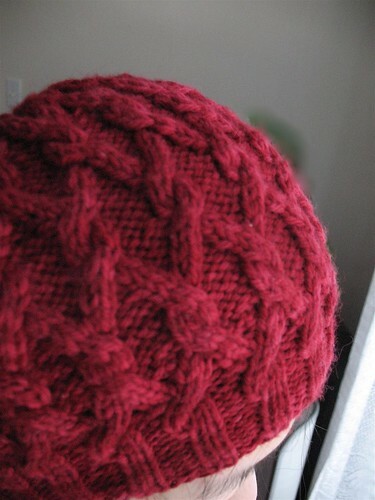 Hopefully with beads next time, but I also think it’s a super easy and quick hat pattern that is very appealing. The ever popular Gretel. 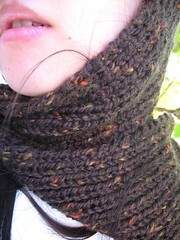 I actually made a regular version of this in February with the Tubular cast on and this same yarn. I wasn’t paying attention and it resulted a lot of errors. It also looked a bit odd on my big head even if it did cover my years. 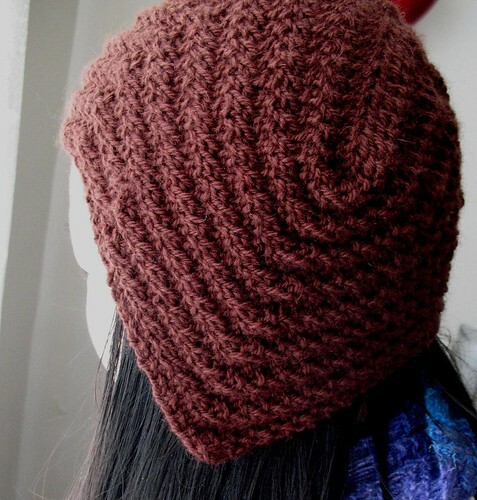 I frogged the hat and my Koolhaas too (since that was too big and hopefully I have enough yarn to make another regular one of those) to make a slouchy version. This time, I used the German Twisted cast on instead of the Tubular cast on because I was lazy and it works just as well. When you’re knitting this pattern, it does seem awfully big on the needles, but it wasn’t as slouchy as it looked on some others because my head is rather large. If I had aran weight, I’d have made the regular. I spray blocked the beret with water mixed with Eucalan. I’ve never owned a beret (I gave away the first one made), and this is a big one. I’m going to have get use to it and incorporate it to my style somehow. The yarn is very yummy though. Modifications: One needle size down for the band and I took out one decrease row. Tools/Notions: I cabled without a cable needle during the 4 st cables, but I used one for the 3 st twist cables because they messed me up the first time I was doing them. It still went along fairly quickly. Lessons Learned: Tubular cast on. Would I knit it again? Yes, but the band gets loose fairly quickly so I would go down to 3.25mm next time. I want to make the regular again and the fitted style too. The tension of this hat is a bit odd, and it ends up being too large on most people. I got gauge, and it was even a little big than I liked on my large head. 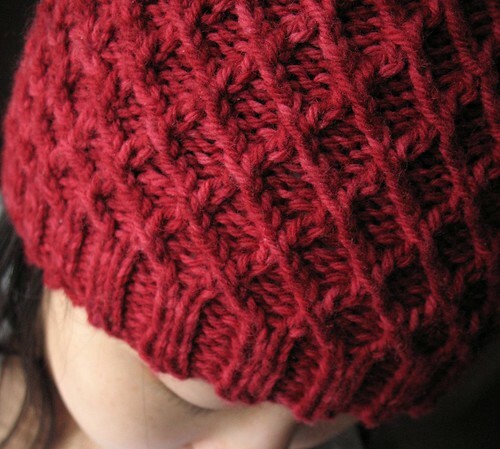 Still, a simple pattern that uses short rows. If you’ve never wrapped and turned, this is good for beginners especially since short rows feature in a lot of shaping of socks. I hate seaming though, but if it covers my ears, so that’s a plus. Not a lot of forehead coverage though. Would I knit it again? Yes, but on smaller needles and/or DK yarn. Modifications: Needle change in ribbing, and I used the slip and switch cable method. Would I knit it again? Yes, but 4 reps instead of the full five. 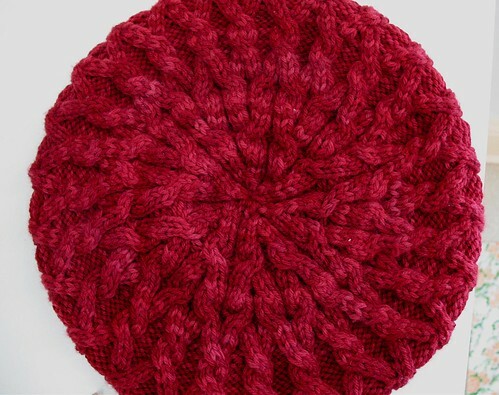 Pattern Notes and Comments: Usually, I have to make hats on the larger sizes because they are a bit too small. This hat was a bit too big in the large size, and it’s quite stretchy so I should have just done the normal 4 reps. I’ve given this hat for my Dad. The decreases are a bit ugly because I messed up, but the bottom cables turned out wonderfully. I didn’t realize until after I took these photos that I forgot to block. The yarn is very nice My first time with Cascade 220, and it really makes Patons Classic Merino look poor in contrast. The 220 is soft, and the variegated red I got it in is a very nice shade. 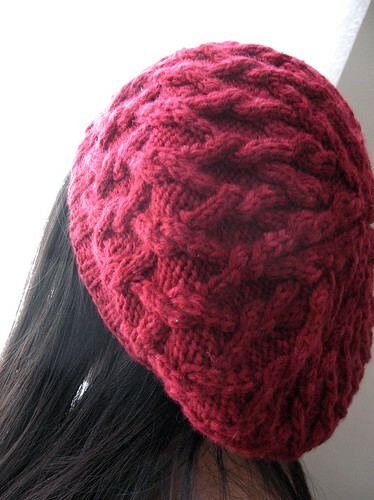 I had to buy another skein since I used the leftovers from the hat to make something else, and then ran out. 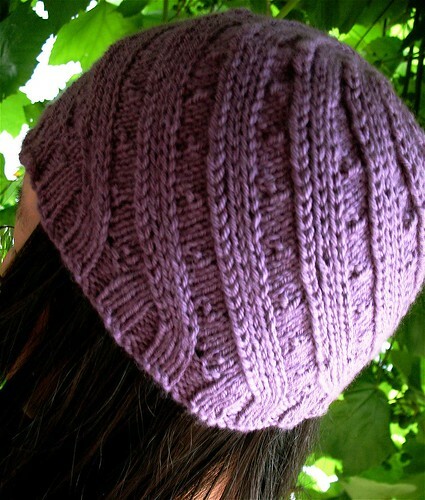 So another Cascade 220 hat to knit in the near future. Bought a lot of yarn in the last couple of weeks. It’s a disease I tell you! Pattern: Fake Isle Hat by Amy King from MagKnits November 2006. Modifications: CO for small size, but I added a few rows it at the rim and in the middle, and then realized it was too long so I skipped a few of the decrease rows. Lessons Learned: Two handed stranding. Would I knit it again? Yes, but I’d probably just do the Small size as written, maybe add a couple of rows for extra length. Pattern Notes and Comments: First colour work project. Started this project on 13/11/07, but had to CO three times. The first time I did it with the big size and it seemed too loose for me (I have a slightly bigger than normal cranium), so I recasted on 18/11/07. That somehow twisted. This actually was actually finished between 19/11/07 and 30/11/07. It’s a bit big because I did knit the large size row wise for a bit, but realised that it was going to be huge so I skipped a lot of decrease rows. 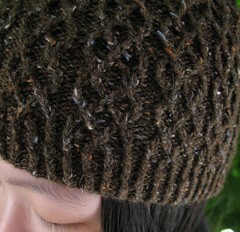 It’s not that bad, but this hat knits up larger than most. The good thing is: it covers my ears! This is my first time using the Patons SWS. I bought a lot of it for this hat and a scarf that I will be making to match. It’s really fuzzy, but not itchy as I’ve heard some people say. My tickle factor is low. I used less than skein of each of the SWS colours so more for the stash. Modifications: Needle size changes, different cast-on. Lessons Learned: I didn’t like the tutorials for the Emily Ocker cast-on online, and wished I had looked in EZ’s explaination earlier because it seemed simpler. Anyway, I used this circular cast-on. Would I knit it again? Bit boring, but it’s good ear flap hat pattern. 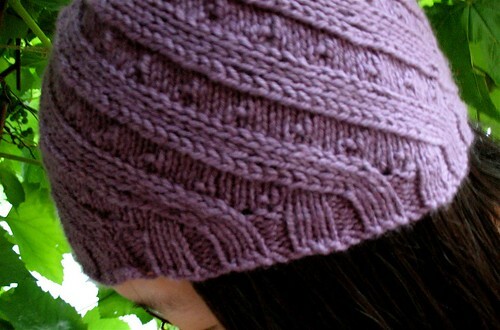 Pattern Notes and Comments: My mom has wanted an ear flap hat for awhile now. I was going to do a conventional, tie below the chin sort of ear flap hat when she said she wouldn’t mind the flaps being long. That’s when I remembered that I had just seen this pattern in the Fall IK. 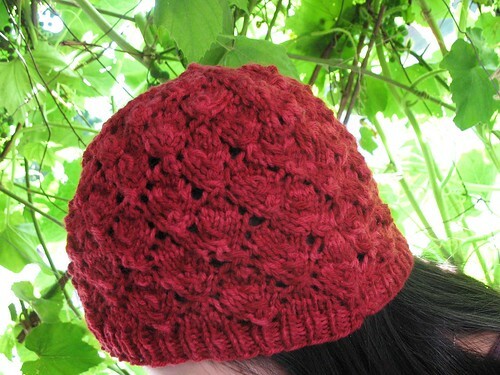 I Magic Looped the hat portion of the pattern. I love Magic Loop even though the bamboo circs I used had a cheap cord. The flaps were about 38″ long, and I modified when I switched needles between the 6mm and the 7mm. 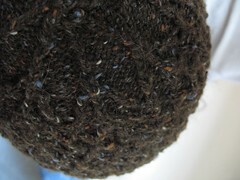 Each flap took exactly one skein of the Chunky Tweed. I love tweed. This is my third tweed hat in two months. I’m a bit of a yarn snob and this was my first time knitting with acrylic in awhile. My mom wanted it to be brown, and apparently, it was hard for me to find affordable, chunky brown yarn. Besides, I think it’ll be warm enough with the flaps being so long. Made for: No one in particular, but I think I’ll give it to Sandy. Pattern Notes and Comments: The tweed knits up very pretty, but the yarn was a bit persnickety. It’s a bit flimsy, and not as good as other yarns in this weight (sock yarn, etc). It didn’t hold up well on DPNs, and I had more ladder issues than normal so the resulting stitches are not as neat as I’d like. It even snapped at one point which was the first time that’s happened to me. 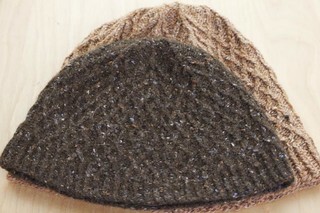 This doesn’t look that bad since the hat is so rustic and tweedy; it masks all the mistakes and shortfalls. I still have another skein of this discontinued yarn so I can make another one for myself or another friend. The pattern is marvelously easy and quick. One of these days, I’ll do it with the intended Koigu. Would I knit it again? 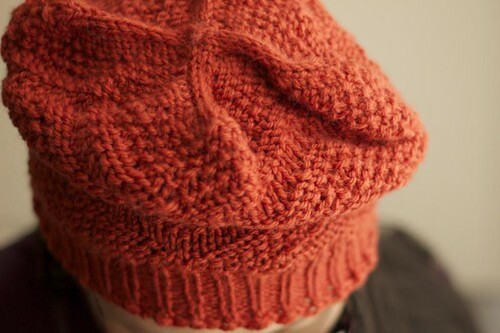 Yes, but with yarn in a lighter colour and I may graft the top rather than cinch it next time. 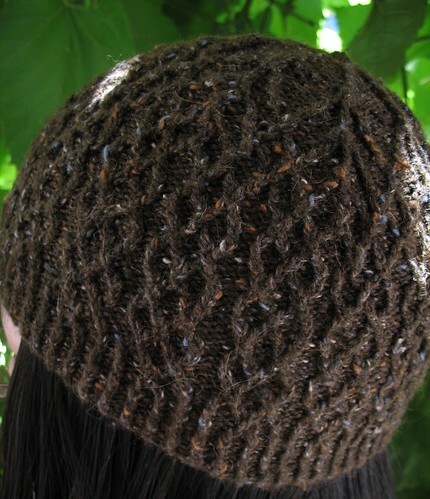 Pattern Notes and Comments: One of the reasons I took up knitting was to make a hat for myself because I’ve had trouble finding a winter hat to fit my slightly larger than average head and cover most of my ears. This hat doesn’t protect the ears as well as I’d like, but I think it will stay put rather than slip up on my head as the store bought ones have done. A lot of knit bloggers do only three repeats before decreasing since this hat is long, but I felt safer going with four due to aforementioned reasons. Five would have been too long for me. This hat may be too thin for the upcoming winter, but definitely will look good in autumn with all that tweed. The yarn is very nice. I liked it right away; I’m partial to DK, and I’ve grown fond of tweed as well. 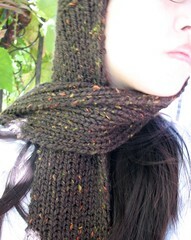 It is also quite stretchy, and I always like alpaca and merino. Rowan wool is expensive around here, but the Felted Tweed is actually less expensive than the patterns’ recommended Rowan Calmer. Still, the most expensive yarn I’ve bought yet. The other gripe is that the wool may be a little scratchy for some people, but I’m usually not bothered by this in the long term. The Phantom colourway may have been too dark, but the cables still pop out. I’m glad I knitted tbl for this as I tried the first repeat with a DPN (lost my small cable needle) and most of the stitches not tbl, and it does look a tad better with the tbl. 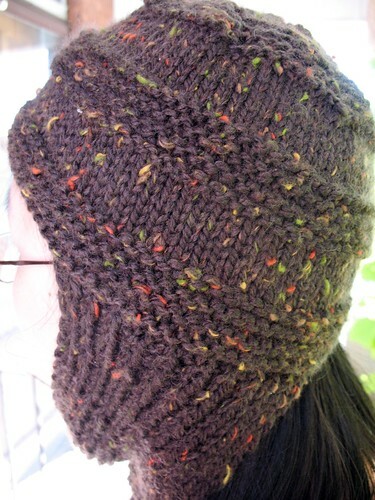 Speaking of the cables, it’s almost necessary to know how to cable without a cable needle to make this hat move along faster. It did not take me a long time to actually make this piece, but it felt like it did when I was doing all those mini cables. I don’t frog or rip back things so my decrease cables are a little sloppy, but overall, I’m pleased. The ladies at the LYS were very impressed since I’ve only been knitting for less than 1 1/2 years. Won’t knit this again for awhile, but I like the result.